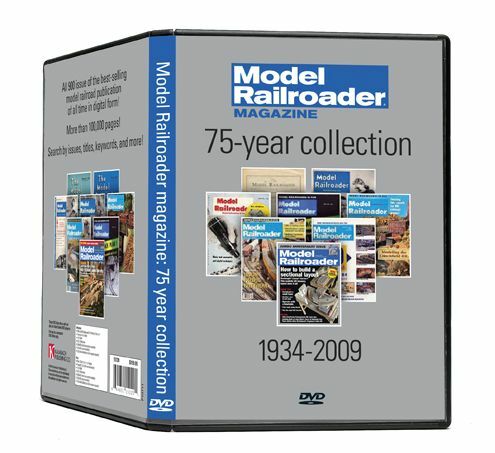 Do I get the “75 Year Collection of Model Railroader”? Recently, Kalmbach Publishing has released a DVD call “75 Year Collection of Model Railroader”. It contains the first 75 years of MR on DVD. On several yahoo groups lists, it has received positive reviews. Owners are happy to read every page of every issue in its entirety. To be able print out the drawings. Cover of "75 Year Collection of Model Railroader"
I am tempted to purchase the collection, as it would result in other savings. First of all, I could dispose/donate 30+ years of MR, thus opening up several shelves for future magazines or existing books that still remain in boxes from my last move. With open shelf space, I’d not have to buy more shelving. Secondly, floor space would be freed, so that I could more simply build my future layout (My MR’s are in the future train room). For the above two reasons I want to buy the DVD. However, there is one significant short coming. The DVD only works on a computer, it does not work on an iPAD or Kindle, the hardware I see using most often for reading and taking to the workbench. The future of magazine reading is the Kindle or iPAD. Secondly, the future of data storage is in the “Cloud”. Amazon, Apple, and others are offering means to store and backup data off-site. In addition to storage, the data is available from multiple locations. I’ve become very fond of this while using Evernote a note taking program. With Evernote I can record notes, image, PDF’s and more from one system (say work) than access them on my home compute, my wife’s, and my Droid phone. I can even access my Evernote information from a web browser should I not have access to my personal hardware. This type of access is the future of magazines too and what I want for model railroad magazines. Amazon, with its Kindle Fire is really tempting me (only $200 to the $500+ for iPAD2). The Amazon way is that I can buy media (book, movie, music, …) once and play it on all of my hardware for life. When one purchases electronic media from Amazon, Amazon does not even charge me for storage. So, the Kindle Fire is also tempting me, I could view and share media at my workbench, on my computer or possibly at a friends much like I do any other web content. I know MR and RMC are both considering electronic publication. Will they distribute themselves or enable Amazon, Apple or others to distribute the electronic magazines? If distributed by others then we can benefit in the Cloud? Do you think Lance Mindheim’s next book will be available for download from Amazon? Could Historical Societies magazines like the Keystone Modeler be on Amazon? How about M2FQ publications through Amazon? I’d love it. This entry was posted in Comentary. Bookmark the permalink. 4 Responses to Do I get the “75 Year Collection of Model Railroader”? The irony of your comments is that in the January 1984 copy of MR, there was a series special 50th anniversary articles which predicted the future of model railroading. One article was specifically about MR publishing, and one of the editors at the time predicted that MR would be read on a “cordless reading tablet” (exact phrase) within the next 25 years. It’s a bit ironic now that such a prediction came true in the sense we have that technology with the predicted time frame, yet as you point out MR still hasn’t made that accessible yet for such a flagship product like this. I agree that access via an iPad or other 10″ form factor tablet would make this product that much more appealing. Since my entry, I’ve seen indication from Kalmbach, that they do not feel a tablet can support the volume of data (3 DVD’s) required for the whole collection. I’m not yet a tablet guy, but I’d think they are correct. To support a tablet, Kalmbach would have put make the data available in the “Cloud”, so that readers could pull the magazine to the tablet when desired. Amazon’s cloud model would work well here. Modelers could purchase individaul copies of MR or the whole collection and pull down the issues as desired. Don’t waste a minute and buy the DVD set. I love it! It goes with me on the airplane and I’ve been reading all the old editions. It’s great stuff and I’ve used it for reference many times already…especially for track plans. Through out all the magazines up to 2012. Love your blog! I’d love it more if it was available from the Cloud. I purchased the Kindle Fire when it first came out and have never looked back. I can purchase or, in some cases, borrow books and either download them to my tablet or store them for the future. The only issue with the Cloud is needing an active Wi-fi close by.